I recently received Stories From History a set of 11 graphic novels to review from Timberdoodle. 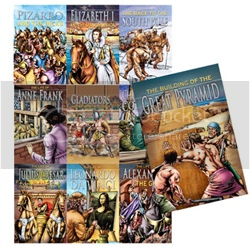 These books are a great way to introduce kids to different historical characters and events. Each book is 48 pages and is illustrated like a comic book. They aren't thin like comic books, though. The books are fairly sturdy and well-bound and since the stories are so short, they are guaranteed to keep your child's attention. * Page 13 of Gladiators and the Story of the Colosseum and page 26 of The Life of Leonardo Da Vinci may need a touch of white-out depending on your family's modesty standards. Each book starts out by introducing you to the characters in the book. There are maps and background info needed to help you understand the time and place each event happens. My son, who gets bored very easy, loved reading these books. He even kept asking me questions to see if I knew the answers. If I didn't he would reply with the answer and show it to me in the Did You Know? section of the book. He liked that each one has a timeline, that way he could refer to that if he forgot when something happened. I like that he wanted to read this without me having to make him read them. I also like the glossary at the end, where he could look up anything he didn't understand. He had more questions, so were able to discuss things and learn more about them. Stories From History is available from Timberdoodle for $16.95, so I think they are very reasonably priced. These books are recommended for children 8-14. I think you could also use them for younger children, if you are reading it to them. Stories From History was provided to me at no cost from Timberdoodle and Mama Bzz in exchange for review. I love that you are such a book person. I absolultely love to read and my oldest daughter and her little girl do too. I need to check some of these out. Oh my, a blast from the past! Timberdoodle was just starting out when I was home-schooling my children many years ago. Seems they are keeping up the good work! I think they are most definitely worth checking out for you parents who want to provide good and moral quality educational things for kids. Hi Nancy, These sound like great books. I loved to read especially when I was young. I love the Christmas-y touch to your blog header! Have a great day. Hi Nancy, Thanks so much for your kind words on my blog. You are the sweetest! Those sound wonderful Nancy- I wouldn't mind reading those myself! I loved to read when I was his age... it's great that you found some books he really enjoys!